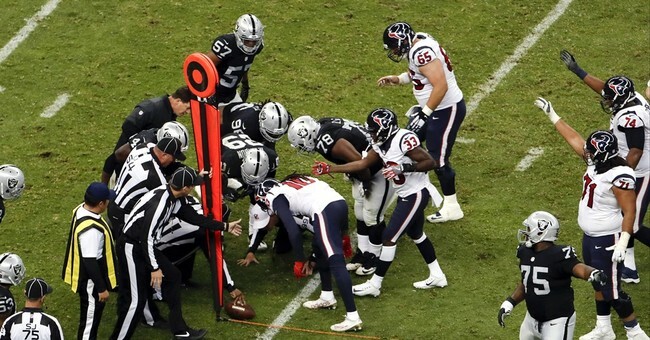 It was fourth down in a National Football League game, and the punting team came onto the field. The other team went into their formation to defend against the punt. Then somebody noticed that the man set to kick the punt was black. "Fake!" one of the defenders cried out. That cry was immediately echoed by others, and the defending team changed their formation, to guard against the kicker either running with the ball or throwing it. But in fact he punted. Why did anyone think he was not going to punt the ball? Because chances are no one on that field had ever seen a black football player kick a punt. As someone who has watched NFL games for half a century, I have never seen a black player either punt the ball, or kick a field goal or a point after touchdown. I have seen hundreds of black players score touchdowns, but not one kick the point afterwards. I have seen a black President of the United States before I have seen a black kicker in the NFL. Politicians, the intelligentsia and even the Supreme Court of the United States have been saying for decades that statistical disparities between racial groups indicate discrimination. If so, then the racial disparities among kickers in professional football exceed that in virtually any other job anywhere. But is it discrimination? The very same people who employ blacks at every other position on a football team are the people who hire kickers. Why would they be willing to hire black players in other positions that pay a lot more money than most kickers get, but draw the line at hiring black kickers? In this situation, discrimination is an explanation that doesn't even meet the test of plausibility. At the other end of the ideological spectrum, there are those who attribute differences in racial representation to genetics. Are blacks genetically incapable of kicking a football? Somehow black colleges have been playing football for generations, without having to recruit white players to do the kicking. But if neither race nor racism can explain why black kickers are so rare in professional football, what can possibly explain it? One of the most obvious possibilities is routinely ignored in many cases of group disparities: Different individuals and groups have different things they want to do. If black youngsters who are dreaming of an athletic career don't happen to be dreaming of becoming kickers, then it doesn't matter whether they have both the innate ability and the opportunity. It is very doubtful if any of the guys who grew up in my old neighborhood in Harlem ever became ballet dancers. Is that because black guys can't dance? Some of the best male tap dancers have been black. Is it because nobody would hire black male dancers? Some black male tap dancers have starred on the stage and danced in movies. Just not in ballets. Many of us have been so brainwashed over the years -- by sheer repetition, rather than by either logic or empirical tests -- that statistical disparities are automatically taken to mean discrimination, whether between races, sexes or whatever. The plain fact that different individuals and groups make different choices is resolutely ignored, because it does not fit the prevailing preconceptions, or the crusades based on those preconceptions. Women make different career choices than men, and wisely so, because men do not become mothers, and being a mother is not the same as being a father. And we can't make them the same by simply calling them both "parents" or saying that "the couple" is pregnant. Discrimination can certainly cause statistical disparities. But statistical disparities do not automatically mean discrimination. When some racial or ethnic groups have a median age that is 20 years older than the median age of some other racial or ethnic groups, how surprised should we be to find members of the younger groups far better represented in sports and members of the older groups far better represented in jobs that require long years of experience? Statistics are no substitute for thought -- certainly not in government policies, and especially not in Supreme Court decisions.